A nationwide survey found that more than half (54.6%) of all U.S. citizens test positive to one or more allergens. . More Americans than ever before, say they are suffering from allergies. It is among the country’s most common, yet often overlooked, diseases. Allergies affect as many as 40 to 50 million Americans. 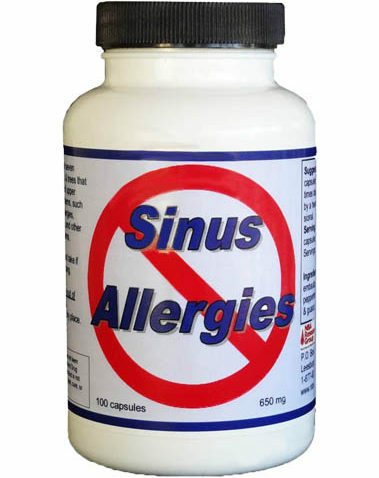 Sinus problems may be the result of allergies. Sinusitis means your sinuses are infected or inflamed. Pollutants, nasal problems and certain diseases can also cause sinusitis. COPD, asthma, bronchitis, and other respiratory ailments affect most people at one time or another. * fights allergies, blocks histamine, reduces asthma, reduces inflammation, dilates bronchials, relaxes muscles. * relieves asthma, reduces inflammation, relieves pain, reduces spasms, kills bacteria. * kills fungi, kills mold, kills Candida, fights free radicals, decogests bronchials. * reduces inflammation, kills fungi, kills Candida yeast, dries secretions, reduces phlegm, relieves pain, reduces spasms. * reduces allergies, reduces inflammtion, cleanses blood, relieves pain, dilates blood vessels, kills germs. * reduces histamine, supresses coughs, relieves spasms, reduces acid, reduces inflammation, stimulates digestion, relieves pain. * suppresses coughs, expels phlegm, dilates bronchials, fights asthma, kills bacteria, kills yeast, reduces inflammation.